The end of the year is rapidly approaching, and it is time to plan those New Years Eve parties! This year, like every year, I will spend the evening with my family before returning home to ring in the new year with my husband and dogs. It is our little tradition. My mom serves the traditional NYE line up – cabbage, black eyed peas, and all sorts of yummy nibbles. When we get home I like to have a few more munchies to help soak up the champagne. This year my midnight munchies are elegant and delicious. Two years ago I had my first taste of cold smoked salmon and I have never been the same. The glistening coral color of the salmon is bewitching to me, and I love to find new ways to use it. 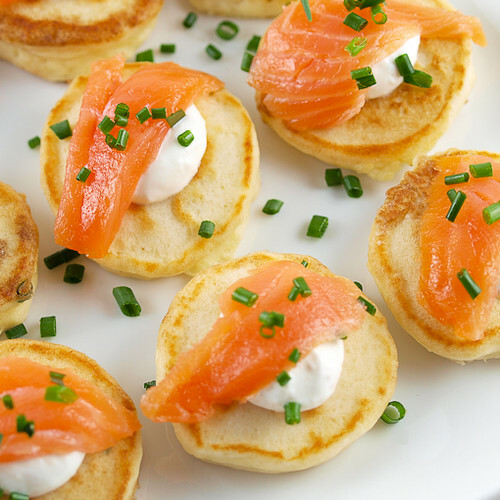 This time I decided to make rich, yet light, cream cheese pancakes flavored with chopped chives for an herbal freshness. 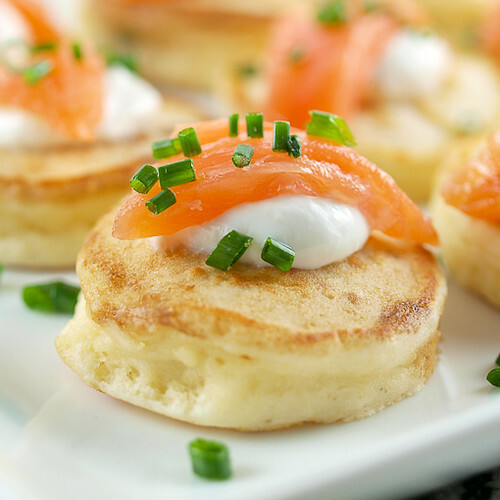 Lightly dolloped on the pancakes is a horseradish sour cream sauce. It serves to hold the salmon in place, and it adds some tangy heat. Last, I garnish with a more freshly chopped chives. Heaven, or bliss, are the best ways to describe these. 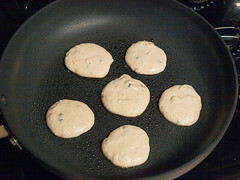 Easy also works, since the pancakes can be made ahead and refrigerated for up to a day, along with the sauce. 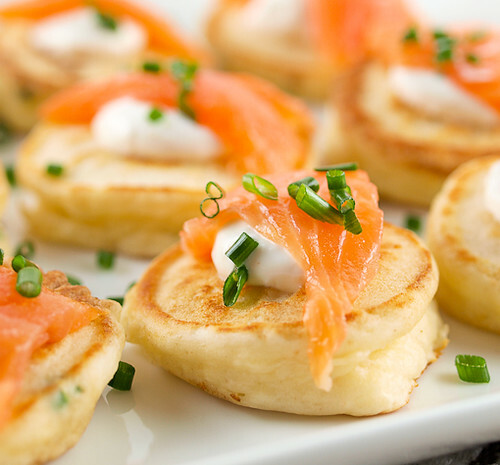 Champagne is all you need to go with these. Happy New Year! Begin by making the pancakes. 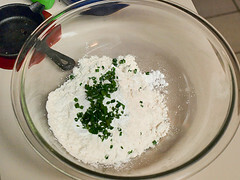 In a medium bowl whisk together the flour, baking powder, salt, and chives. 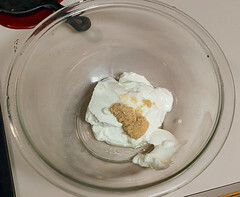 In a small bowl cream together the cream cheese and butter until smooth. 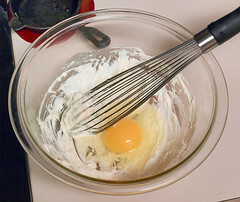 Add the egg and whisk until completely incorporated. Whisk in the milk. 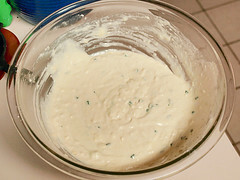 Pour the wet ingredients into the dry and whisk until just incorporated and no large lumps remain. Do not over-mix. Heat a non-stick skillet over medium heat. 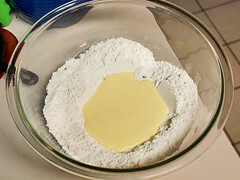 Spray lightly with non-stick spray then scoop the batter by the tablespoon into the pan. 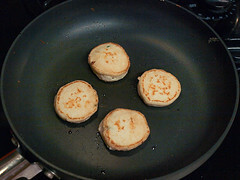 Cook for one minute on the first side, flip, then cook for an additional thirty seconds, or until the cakes are golden brown and spring back when gently pressed in the center. Remove to a plate to cool while you prepare the rest. 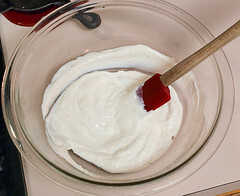 While the cakes cool prepare the sour cream sauce by adding the sour cream, horseradish and salt to a small bowl. 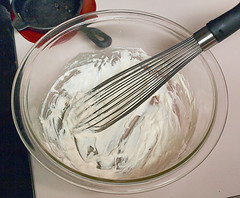 Whisk to combine then let stand ten minutes. 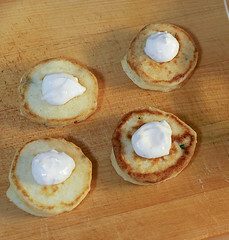 To prepare, spoon a heaping 1/4 teaspoon of the sauce onto the center of the cakes. 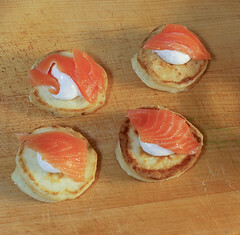 Top with a piece of the salmon. 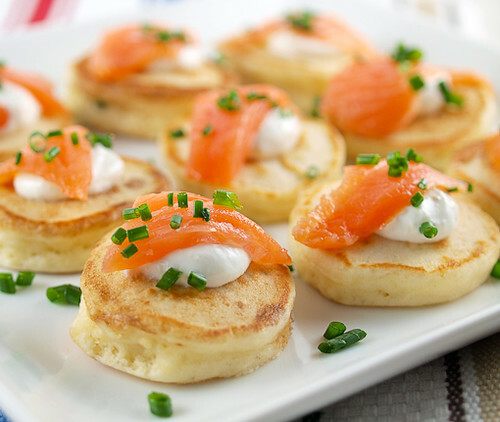 Garnish with the chives. These can be assembled up to one hour in advance. Serve at room temperature. © 2010 – 2016, Evil Shenanigans. All rights reserved.